My wife and I did a road trip round Mada with Rola from the 9th - 30th September (22 days). Rola is not only a first-class driver but he is also a superb guide. He is honest, trustworthy and extremely reliable. He is totally dependable – you can trust him with your life! Rola is fluent in French & Malagasy – but his English is also very good too. We had no problem whatsoever communicating with him and he was always very keen to improve his English with us during the time we were together. On a 3-week trip round Madagascar, you know there are going to be a few glitches along the way – it’s the nature of the place. But whenever we encountered even the slightest problem, Rola was always there to offer us his help, support and advice. He truly cares about his clients and wants them to really enjoy their Mada experience. 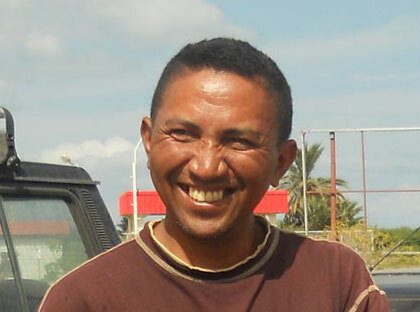 Towards the end of our trip, Rola became much more than just a “chauffeur-guide”, he became a true friend and we thank him enormously for looking after us and for making our holiday in Madagascar a truly memorable experience. Salut, Rola - à bientôt !!! !